Plan D: Can the Senate Salvage This Mess By Passing a Scaled-Down Bill? 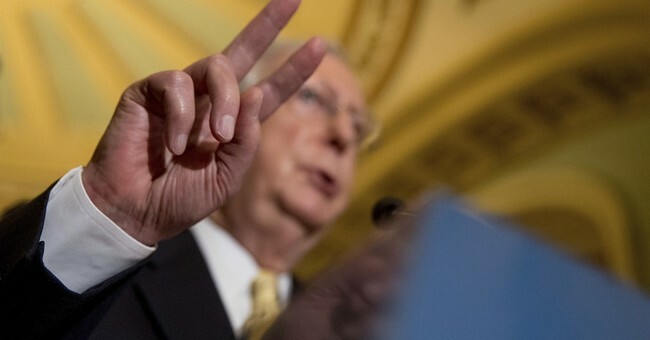 In the wake of Monday evening's healthcare meltdown in the US Senate, some conservatives are grappling with the possibility that after years of promises and hard-fought electoral victories, the GOP may come away totally empty-handed on even restraining Obamacare. This outcome, needless to say, would be an epic political double-cross of the Republican base. It would also offer no relief to the millions of people being actively harmed by Democrats' collapsing law. But recall that when the House canceled its initial AHCA vote in an embarrassing turn of events, many observers wrote off the entire endeavor as over and done. The 'repeal and replace' project had blown up on the launchpad, it seemed. And then came the MacArther amendment breakthrough, leading to a once-improbable result: The bill passed. It seems unlikely that the Senate's divisions will be bridged in a similar fashion, but perhaps some good can still come of this fiasco. There is an alternative, if not a very satisfying one. Republicans seem to be able to achieve near-unity on ending the individual mandate, allowing insurers to offer discounts for younger people, protecting taxpayers from having to subsidize abortion coverage, and giving states some freedom to relax regulations. They should work for legislation that achieves these goals and includes as much Medicaid reform as 50 senators are prepared to tolerate. Republicans should not claim that such legislation would repeal and replace Obamacare, since it would not, and should make it clear that additional legislation will be needed in the future. The conservative holdouts should be prepared to judge this limited legislation based on whether it gives people more freedom to choose the health insurance they want, not on whether it does everything for which Republicans have been campaigning over the last seven years. Whether more taxpayer money should be given to insurance companies to stabilize Obamacare’s markets, as Democrats will surely demand, should be left to another piece of legislation. Republicans should be open to passing it, given the continuation of Obamacare, but only in return for more reforms. The Senate Republican bill abolished Obamacare’s fines for people who go without insurance: the “individual mandate” that has been one of the law’s least popular features. Since the bill did not abolish Obamacare’s regulation requiring insurers to treat sick and healthy people identically, the bill had to do something to keep people from gaming the system by waiting until they got sick to buy insurance. (If enough people acted on that logic, insurance markets would unravel.) What the bill did was impose a waiting period before people coming back to the insurance rolls could get a tax credit to help with their purchase. It also made insurance more attractive to young people by allowing insurers to give them larger discounts than Obamacare does...At the very least, Republicans ought to abolish the fines this year. That might also involve allowing more price variation by age, imposing the waiting period for the tax credit, and making stabilization payments–that last item being possible to move in separate legislation, as the editorial suggests. As I think about it, this would be an "improve Obamacare with conservative ideas" bill -- not a replacement, and certainly not a repeal. Is that good enough? Not really. Is it better than doing nothing, or Plan C? Undoubtedly. Repeal the individual and employer mandates (replacing the former with a coverage-incentivizing waiting period to hold off free riding that drives adverse selection), allow insurers to adjust the "age bands" in order to make plans at least slightly more affordable for younger and healthier consumers, and give states the flexibility to seek waivers for some of Obamacare's cost-driving coverage mandates (even though the politically-sensitive ones would likely stay in place). Eliminate a few of Obamacare's worst taxes. And do it all within the bounds of the Hyde Amendment. As for the amount of marginal Medicaid reform that 50 GOP Senators "are prepared to tolerate" (what a depressing sentence), this has been a real sticking point. Perhaps all sides could agree on equalizing the treatment between expansion and non-expansion populations vis-a-vis federal subsidies, and maybe to implementing an extremely modest cap on the future rate of federal spending growth on the program. Even when Republicans nominally control the government, liberals still dictate policy bc Rs are afraid that media will portray them as mean. Is that really the taste Senate Republicans want to leave lingering in their base voters' mouths? Complete failure? UPDATE - Hmmm, does McConnell have one more card up his sleeve? Either way, he should think hard about 'Plan D,' too.